When I saw this book available for review from Rockstar Book Tours, I jumped at the chance. It sounded like just the sort of book I enjoy: slightly dystopian, slightly thriller, different. Black River Falls lived up to expectations. In a quarantine camp of virus victims, Cardinal is one of the few with intact memories, forcing him to wear mask and gloves whenever he's near people. Naturally, he's only survived this long without catching it by distancing himself. He retreats to the woods at the far ends of the camp, but is soon joined by a former bully--who no longer remembers his tough guy ways--and a gaggle of kids the bully has rescued. Once the book makes you care about Cardinal, the story starts to expand, bringing in a girl who apparently came there to purposely lose herself. With no idea of her family or past, they name her Hannah. And Hannah's arrival changes the dynamic, awakening Cardinal's memories of his family. The story slowly reveals Cardinal's past and the fate of his family, including his famous comic- book-writing father. It also gives us a slow reveal of Cardinal's former relationship with Greer, the bully. The thriller part comes from the hand-over of the camp from the National Guard to a group of private security forces. The Marvins are the unknown entity, and their designs on the helpless people may be less than altruistic. Usually I get frustrated with books that keep secrets, and there are a lot of secrets in this story. But Hirsch knows the value of not withholding too much for too long. The reader gets enough dribbles of information to keep them hanging. This book really had me turning pages, curious to learn more. Despite my busy schedule, I finished Black River Falls in record time. There is something so genuine but so refreshing about Cardinal (named for his father's super-hero character)--part lost kid, part wise man. He's balancing the crushed part of himself from his own tragedy, trying to keep his distance from infected, and shouldering the load of a bunch of kids. There's so much about him to admire. And Greer, the former bully, turned good guy really gave me something to think about. If the memories of our past disappeared, would our characters stay the same or would be make a new start and be very different people? Food for thought. While the main characters are complex and full, my one complaint is that the kids they protect are mere shadows, known by little more than their names. I suppose they were kept blurred and ill-defined in the interests of saving word count, but I felt we got to see more about the two dogs than the group of kids. At times the thriller part of the story suffers to the pursuit of character arc. 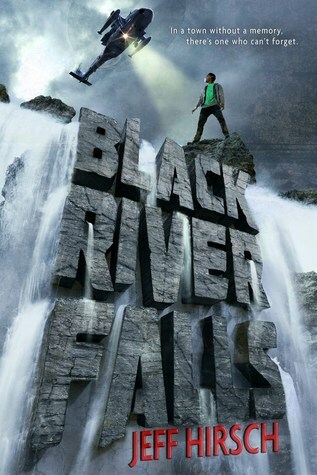 Don't expect Black River Falls to be all action. Much of it is given over to the introspective of Cardinal, as is the case of any young adult book that stays in your mind over time. A good solid read with no easy answers, and one that will leave you thinking. 3 winners will receive a finished copy of BLACK RIVER FALLS, US Only.